Undergraduate theology students viewed the exhibit MOCRA: 25 at the Museum of Contemporary Religious Art at Saint Louis University on Nov. 27. There’s a reason there are chairs placed in front of James Rosen’s “Homage to the Pietà d’Avignon” (1989-91) at the Museum of Contemporary Religious Art at Saint Louis University. That’s because the artwork is so peaceful and mysterious, it’s well worth a long reflection. People who stop to observe it generally lower their voices to a whisper as they approach it. Painted with layers of oil and wax, the colors gradually reveal themselves. Studying the image of the body of Jesus in the arms of His mother taken down from the cross, Saint Louis University freshman Ben Kelly of Annunciation Parish in Webster Groves lowered his voice and explained his interest in it. Kelly, viewing the art with classmates from his theology class, added that the image motivated him to read the accompanying placard about the artist and what inspired him. The current exhibition of 25 artists honors the 25th anniversary of MOCRA, which opened in a renovated seminary chapel on the campus of Saint Louis University in 1993. Since then, through the course of more than 60 exhibitions, accompanied by wide-ranging programs (including a podcast), MOCRA has continued to promote dialogue between artists and religion and spirituality and between viewers and artworks. Curated by Father Dempsey, “MOCRA: 25” includes works from the MOCRA collection and a few works on loan, just a sample of the 25 years of exhibits. Only two of the artists have not exhibited there previously. 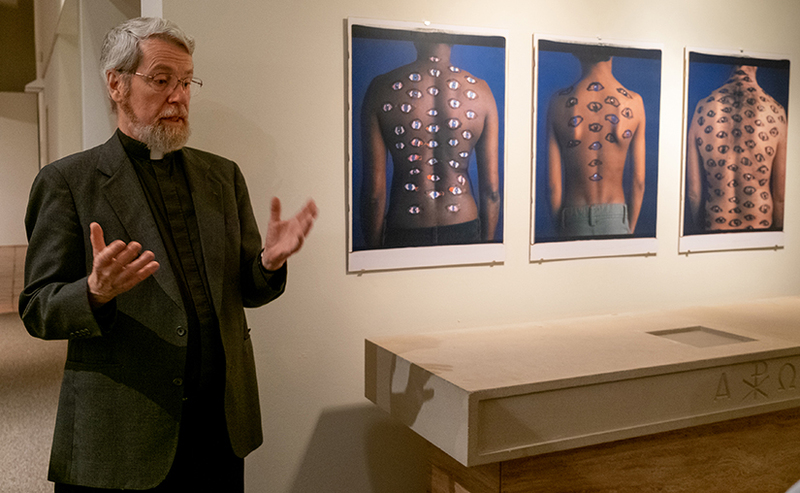 Father Terrence Dempsey, S.J., founding director of the Museum of Contemporary Religious Art at St. Louis University, talks about the work "Sagrada Familia" by Maria Magdalen Campos-Pons as undergraduate SLU students view the exhibition MOCRA: 25 as part of their theology class at the museum on the SLU campus in the Midtown neighborhood of St. Lous Tuesday, Nov. 27. 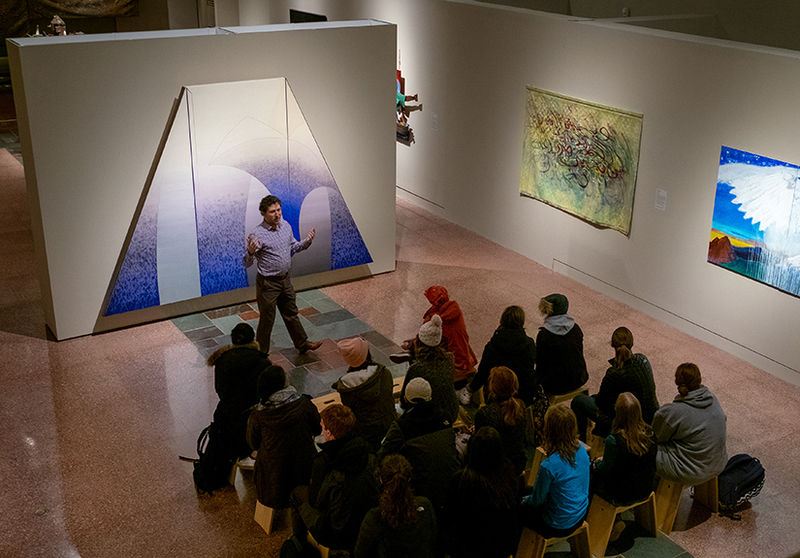 David Brinker, assistant director of the Museum of Contemporary Religious Art at St. Louis University, discusses the current show MOCRA: 25 with undergraduate SLU theology students at the museum in the Midtown neighborhood of St. Lous Tuesday, Nov. 27. MOCRA opened as the first museum of its kind, and it still may be the only contemporary religious art museum. Father Dempsey credits his mentor, the late Jesuit Father Maurice McNamee, professor of art history and director of Cupples House at SLU, with the idea of using the then-empty chapel as the space for MOCRA. Volunteer architects Paul Marti, Dan Esarey and others advised him in the effort. Some of the side chapels used as exhibit space include the altars that were there previously. 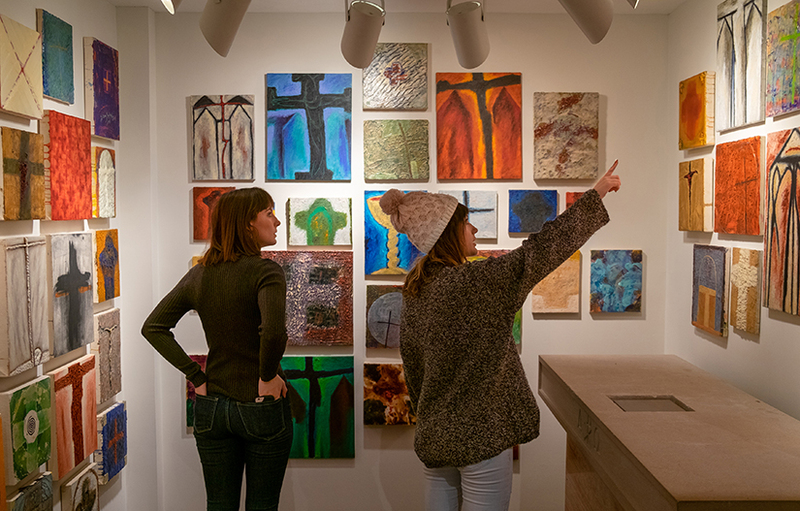 Saint Louis University’s Museum of Contemporary Religious Art (MOCRA) is the world’s first interreligious museum of contemporary art that engages religious and spiritual themes. MOCRA is dedicated to the ongoing dialogue between contemporary artists and the world’s religious traditions and to serving as a forum for interreligious understanding. MOCRA intends to be inclusive and embracing, a center for healing and reconciliation. The Society of Jesus (the Jesuits) has a long association with various artistic disciplines, including music, dance and visual art. This engagement is rooted in Ignatian spirituality, a way of living out one’s faith in the world, grounded in the insights of the founder of the Jesuits, St. Ignatius of Loyola. Central to Ignatian spirituality is the belief that God may be found in all things — an assertion that we can encounter the divine in all aspects of our lives and in all of our circumstances. WHEN: Tuesday-Sunday, 11 a.m. to 4 p.m. through Feb. 17 (closed Dec. 22 through Jan. 7); Admission is free, though there is a suggested donation of $5, or $1 for students and children.